Findbostonbombers: Reddit vs. the media in search for Boston bombing suspects. Are a bunch of Internet “vigilantes” behaving more responsibly than professional journalists in the hunt for the Boston bombers? 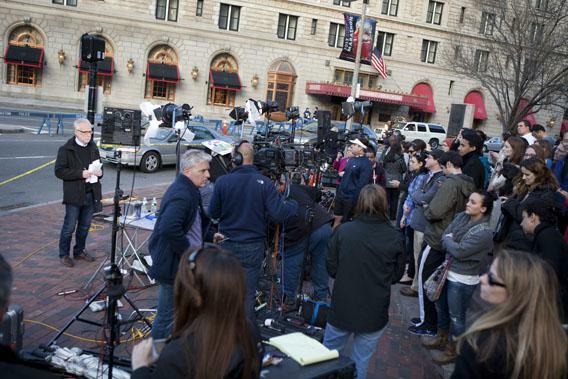 Two days after the tragedy, Wolf Blitzer of CNN attracts a crowd as he waits to go on air in Copley Square, close to the site of the Boston Marathon bombings, on April 17, 2013. Boston has been inundated with media from around the country and the world. It’s easy to mock Redditors for an abundance of self-righteousness and a shortage of self-awareness. Really, guys? Reddit bills itself as “the front page of the Internet” and ranks as one of the most popular websites in the United States. You’re saying that when a popular post on the site goes viral, its users bear no responsibility for that? On Reddit, “the media” has become a pejorative term. But let’s face it: Reddit is the media. The main difference between it and, say, a newspaper, is that Reddit’s content is posted and curated by amateurs through upvotes, downvotes, and occasional moderator interventions. Still, the results are similar: a top post on any given subreddit has a chance to reach as many viewers as a popular newspaper story, and in some cases far more. It’s disingenuous for the site’s users and moderators to disclaim responsibility for any harm caused by those posts—especially since they’re more than happy to claim credit when things turn out well. But here’s the thing that many in “the media”—that is, the professional media—are overlooking. The Reddit hive-mind does have a conscience. There’s a lot of id to be found on the site, sure, but there’s also a superego. As I noted yesterday, one of the top posts on the findbostonbombers thread was titled, “Does anyone remember Richard Jewell?” The post urged Redditors to exercise caution in identifying potential bombing suspects, lest they end up ruining the lives of innocent people like the security guard falsely accused of the 1996 Olympic bombing. That conscience is in even greater evidence today. The top post as I write this story is a list of “innocent suspects,” an earnest attempt to clear the clouds of suspicion that have gathered over some of the people that Redditors (and, yes, a few media outlets) have flagged as suspicious. The Facebook post in question asks people to share a picture of Blue Robe Guy as widely as possible in hopes of identifying him. Of course, things like that do happen, and it’s to Redditors’ credit that some are starting to recognize that, and to acknowledge their own complicity. 2) DO NOT POST ANY PERSONAL INFORMATION. 4) Theories are welcome, but make sure you fact-check your sources. 5) Remember, we are only a subreddit. We must remember where helping ends and the job of professionals begins. 6) Do not make any images viral. Limit reposting images outside of this sub. 7) Finally keep in mind that most or all of the “suspects” being discussed are, in all likelihood, innocent people and that they should be treated as innocent until they are proven guilty. Now, merely stating those rules doesn’t absolve the site of anything. And some of them, like the one about not making images viral, are hopelessly naïve. As Yahoo’s Rob Walker memorably rephrased Rule 6: “We’re unleashing the power of the crowd—don’t tell anybody!” Still, those edicts are hardly the credo of a mob bent on exacting retribution, as some professional pundits have been too quick to imply. I see them as an earnest attempt to grapple with the tensions inherent in the project of publicly crowdsourcing information about a crime. And for what it’s worth, the moderators seem to be serious about deleting posts that include anyone’s personal information. Is Reddit more conscientious than the mainstream media? That’s too sweeping a claim, given the existence of thousands of professional media outlets that have been careful to base their coverage on facts and refrain from wild speculation. But is it fair to say that the Reddit hive mind has at least shown more self-awareness and more of a conscience than certain tabloids that aren’t worth their weight in trash? Absolutely.